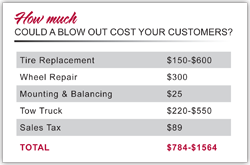 Don't let road hazards ruin the travel plans of your customers. Provide them with the peace-of-mind protection they deserve and protect their new investment from common road hazards such as metal, nails, screws, potholes, glass and debris. Maximize Your Dealership Potential & Contact Us Today! © 2018 Coach-Net. All Rights Reserved.